There are a number of factual genres important to writing in the primary [elementary] school. What are Reports Used For ? Most reports give information about the world and they can be used to document and store information about different subjects. Reports classify and describe living things like plants and animals, non-living things like volcanoes, tidal waves, the stars, and things in society like the way people organize the government, the education system and different kinds of technology like computers, television or satellites. Some reports are written for experts who work in a field, some for beginners who are just finding out about something and some are written for people who are interested in a particular subject for a special reason like a hobby. What are the Stages of Reports about living and non-living things ? 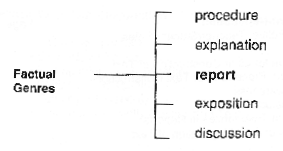 The stages of a scientific report usually include: a General Classification of a subject and a Description of the appearance, the behaviours, and the special or interesting habits of the subject. 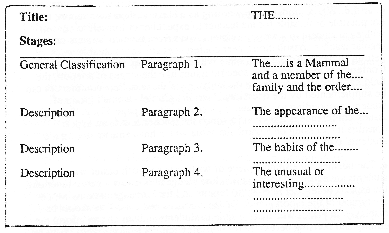 If a report is about a non-living thing, then the writer describes uses of the subject and not its behaviours or habits. How is a Report Divided Up on the Page ? The report writer usually begins a new paragraph at each new stage of a report The paragraph divides the writing into sections. It begins on a new line or it begins on the next line indented from the margin. The writer usually introduces new information about the subject by beginning a new paragraph. The first sentence of a paragraph can be called a ‘topic sentence’ because it often gives a clue about the topic of the rest of the paragraph. How can you tell what Information a Writer thinks is Important ? Sometimes it helps to read a report and try to turn the information into questions. This can show what kind of information the writer thinks is important. These questions can also be used to plan research in a new field. Similar questions can be used to guide your reading about a new field or subject. Following is an annotated transcript of the conversation between a teacher and a class as they jointly constructed the report about whales … . Notice how long it takes the teacher to build up a short section of the report about the ‘Baleen Whales’. OK, this is the way we started about the Baleen’, (reading) “They are two-toned in colour’. What shall we put down here ? Yes it’s blue but it’s got a bit of grey in it. Alright, so (writing) “Baleen Whales are grey-blue in colour”. Yes. Miss, are we going to have how the ‘Baleen Whale’ eats? We’re going to have that in the … . What part? OK, we’re just comparing the way the two of them look now. Allright, we’ve put about that. What about the important thing? What makes them all ‘Baleen Whales’ ? They have baleen instead of teeth. Right. Do you know what baleen is ?…. Right, like a filter which helps them? Good, (writing) “They have baleen instead of teeth which helps them filter food from the water.” What else do we know about them? The size – they’re larger than the Toothed Whales’. Yes, and who belongs in this group? No. We know its the ‘Baleen’ group. But who belongs in this group ? Yes. And what is the ‘Blue Whale’ ? Is it just the ‘largest whale’ or is it something else? Right. It’s the largest living thing on earth. (Writing) … .” Having the …which whale? (writing) “as a member of their”? And how big does the ‘Blue Whale’ get to? This report was written by Year 5C at Tempe Primary School. Whales are sea mammals and are warm-blooded. They belong to the Cetacea Order and they can be divided into two groups – the Toothed’ and the ‘Baleen’ Whales. They are grouped together according to whether they have teeth or not. Whales have smooth skin. All whales have a layer of fat called ‘blubber’. It is used to keep them warm when they dive deep. Their bodies are streamlined which means they are long and slim enabling them to move through the water. They have a few bristly hairs on their snouts. A whale’s tail is called a fluke. It helps them to move forward in the water. They have two flippers to help them steer left and right and to balance. Their eyes are on the sides of their heads. Because of this they don’t rely on their eyesight for swimming. Instead they rely on radar or sound waves. The whale’s nose is called a ‘blowhole’ and is situated on top of their heads. The blowhole is used to get air for their lungs. The females of the species are called ‘cows’, the males are called ‘bulls’ and the babies are called ‘calves’. TOOTHED WHALES: These are two-toned in colour, dark on top and lighter on the bottom. They have teeth. They also have rounded snouts while some have pointed snouts. Some have long dorsal fins on their backs to stop them rolling over. They are fast swimmers. Toothed Whales are smaller in size compared to Baleen whales. The dolphin is the smallest whale – it ranges in size from 2 to 3 metres and can weigh up to 95 kilos. BALEEN WHALES: These are grey-blue in colour. They have baleen instead of teeth which helps them to filter food from the water. They are the largest group of living things having the Blue Whale as a member of the family. It grows up to 32 metres long and weighs 150 tonnes. It is known as the largest living thing on earth. Whales come to the surface for air. They spout old air out through their blowholes and take new air in. The Baleen Whales surface 2 to 3 times per minute unless they are in danger, or catching food. They live in salt water. In summer whales migrate to cool waters of the Poles and in winter they migrate to warmer waters of the Equator. The Toothed Whales eat squid and fish and the Baleen Whales eat krill and plankton. The Blue Whale’s heart beats one beat per minute and lives for 90 years while smaller whales live for 35 to 40 years. The cow can reproduce at the age of between 5 and 10 years and is pregnant for 2 years. The calf is born alive, tail first. It drinks its mother’s milk and the mother cares for it until it is old enough to hunt for itself. The small whales hunt in pods or schools and the larger whales hunt in pairs or individually. They communicate by singing, clicking or squeaking. Whales are known as ‘friendly giants’. They are playful and friendly towards other whales and humans. They jump out of the water and this is called “breaching’. A pod of whales sometimes beach themselves. It is thought they do this when the leader or the smallest one is sick. This is a very successful report text from a Year [Grade] 2 student. In terms of tenor, the writer focusses on generic participants: in fact ‘Bats’ are thematic in most of the clauses. Note the greater control displayed by this writer of the reference to ‘Bats’: there is a consistent use of the plural pronoun to refer to ‘groups of bats’. This text shows a more extensive field knowledge. The writer is making more use of technical language to refer to new insights (‘nocturnal’ and ‘echolocation’.) and also showing an understanding of what these mean i.e. 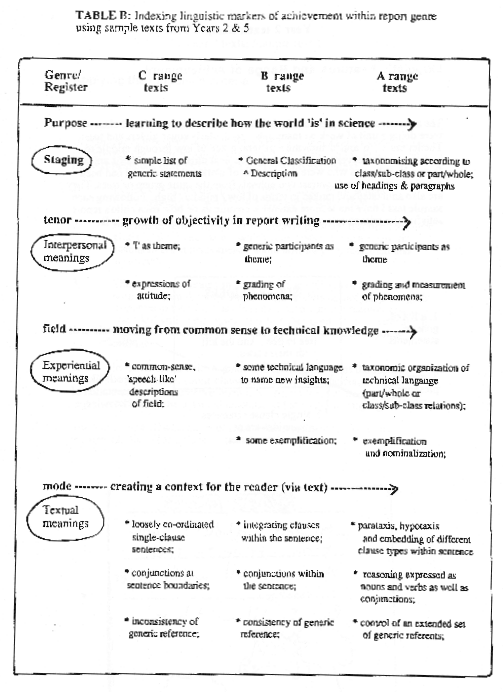 making use of nominalization and exemplification. hypotaxis in “Bats use echolocation //to find food// and to avoid obstacles//”. Parallel with the development of greater facility with a range of clause types is the use of a wider range of conjunctions conjunctions to express reasoning. This text is in the top range of report writing in this class – showing control of genre, field, tenor and mode relevant to factual writing in Year 2. 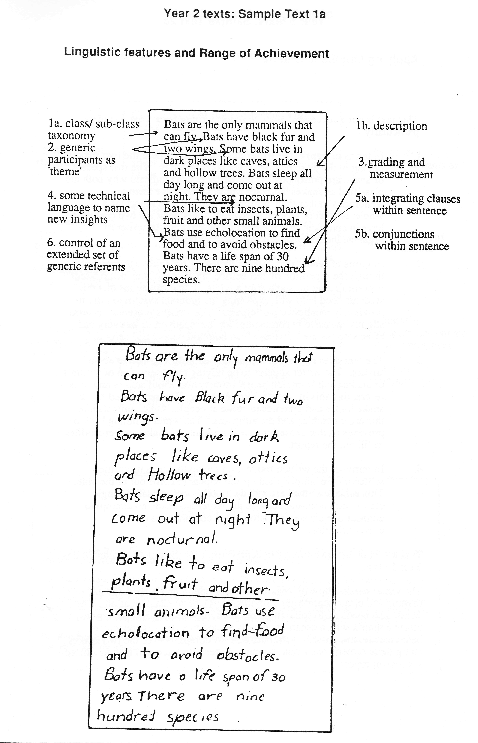 The teacher could extend the child further by asking him/her to write a report comparing and contrasting two different species of bat or two mammal groups e.g. ‘Bats’ and ‘Sloths’.